Border Crossing and a middle child ruining the photo. 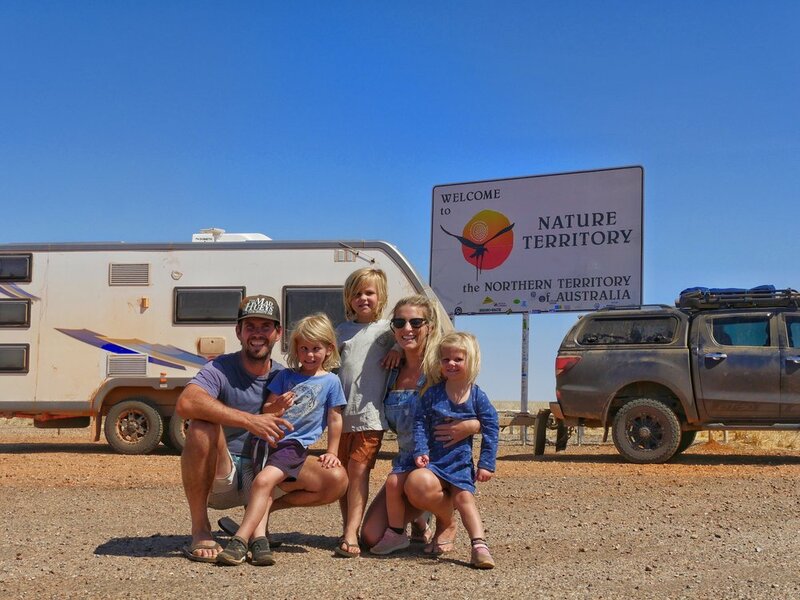 The industry is booming with families hitting the road for an adventure of a lifetime. Exploring our own backyard with the kids in tow, its’ a great way to bond together as a family unit and see the amazing sites of Australia. So, how do we manage being on the road full time? Travelling Australia is something we’ve always wanted to do. Explore each and every state, chase the sunshine, live by the beach and have quality time together as a family. It's very appealing isn't it?? Deciding to travel Australia is a very daunting decision, but it’s also an exciting one too! Looking back now, I think that it’s a pretty courageous decision, to pack up your life and drive into a world of unknown. On the way to Albert River Campground near Bourketown QLD. For us, we wanted to relocate, my husband had a change in job circumstances where it was making him unhappy. We had no family support as they all lived interstate and me as a mum to three kids all under three. I was housebound a lot and Justin (my husband) was working big hours, days, night and afternoon shifts! Do you know how hard it is to keep a newborn quiet while Justin slept after night shift. It wasn't an ideal situation, but we were making it work, because thats just what you do! So this is how we came to the decision to hit the road and travel Australia. Plus we thought it was an ideal time as the kids weren't school aged. Firstly we started to research caravans for quality and build. Then came the essentials within the caravan that would make our life easier with three kids on board. That definitely meant a shower, toilet and washing machine. Triple bunks were a must as we didn't want to be pushing beds out and making them on those overnighters. It really is about making life easy to enjoy your time on the road! The inside of our second caravan, a Jurgens Solaris. We checked out a local caravan dealership and the very first triple bunk van we stepped into was a Jurgens Narooma, the van we had for our first 2 years of travel. That day, we walked away as we didn't want to commit on the spot. There was still more research to be done and caravans to look at. We kept coming back to the Jurgens and two months later we had purchased it. When doing your research on caravans be sure to purchase a van that meets the needs of your family. Theres doable and theres enjoyable! Our van is enjoyable, easy to set up, easy to maintain and trouble free. All set up and eating dinner at Darwin Freespirit Resort. Once we had actually made the big decision, excitement set in. With a 4 month old baby, 21 month old and a 3 year old, I slowly packed up the house. Contacted an agent as we had decided we would sell our home. We didn't want any strings attached and the rental market was dismal with the mining downturn. Our house went up for sale on line at 6pm, by 9pm a couple had booked an inspection for 9am the following morning. After cleaning like a maniac for an early inspection, we had an offer that we accepted at midday that day!!! We were beyond happy! Our dreams of travelling Oz were becoming a reality. Just two months after our initial decision we set off in a Jurgens Narooma Family Van with three kids. Jack 3.5 years old, Billy 2 years old and our daughter Charli 6 months old. We left on the 22nd of December in 2015 from Newcastle, NSW. As we had done a lot of the coastline from Newcastle to Brisbane, we made our way straight for the inlaws in Coolum, QLD. This was a great way for everyone to adjust to living in a caravan without being in a caravan park. It can be hard enough to keep the kids quiet, let alone adjusting them into full-time van life. We spent about 5 weeks here, doing a few modifications to the caravan and researching our travels. our first family pic in front of the van, in our driveway! I look back now and that was a tough time. Our kids were really unsettled and we even talked about turning back! So glad we didn’t! Not only was it big for the kids to slot into life on the road, Justin had to adjust also. He wasn't used to being around the kids 24/7, as well as his wife! I realise now that this 5 weeks settling in and adjusting was one of the best things we did because once we left Coolum we felt really ready. Our house had sold way quicker than anticipated so we were on the road a lot earlier than we thought. After that first month, it all became second nature and we got into our groove. It became simple, easier, enjoyable and we were in holiday mode. So how are we able to hit the road full time? After years of saving and more saving, our dreams of travelling Australia for 12 months became a reality. We are smart with our money, never had expensive things, our furniture was second hand, we owned everything outright and had no debts - other than the house we lived in. Each week we put away money into a seperate account and watched it rise and rise over the years. Even before we had kids we were doing this! We had a fair chunk of money set aside to travel Australia. Although we weren't sure when we’d actually be doing this, the money was there so it seemed like the ideal time. My husband had a great paying job as a diesel fitter in the mines, which enabled us to save up for the trip. We budgeted and kept all our costs at home to a minimum. Little things like Instead of dining out for dinner, we opted to dine in at home, a big saving right there and all these dollars went straight to the travel fund. Our bills were kept as tight as we could and all these savings went into our separate account. OUR TRAVEL FUND!! We did a lap of Oz budget and figured that to do it comfortably we’d need about $50,000 for a 12 month trip. We were willing to work if needed to top up our savings. We had the money from the sale of our house and we have met many people travelling and using these funds, but for us this wasn’t an option!! We have kept this money aside for when we decide to settle and buy our family home. I don't think we could have done it knowing we’d come back with zero dollars. We sold our home, but what about our contents? All our furniture, white goods, gardening and home maintenance, toys and baby goods, nik naks and second car, SOLD. Yes, we sold absolutely everything! But, those precious photo memories, canvas’s, certificates and trophies, those ‘things’ you cant possible get rid of are in a storage shed along with all Justins tools. We paid an upfront 12 month payment for a 1x3m storage shed that contains our beloved ‘things’. We made this upfront payment as we didn't want the extra debit coming out fortnightly. Much easier that it was paid for and we didn't have to allow for this in our travelling budget. This also saves you about 10% on fees.. Speaking of budget, yes we absolutely have one. We work off a $1000 per week expenses. This covers food, fuel, accomodation, car and van maintenance, activities and attractions, insurances, phone and internet bill, takeaway and treats, clothes and shoes. We maintain this well as we are now into our third year of travel. Our first lap, it was entirely paid for through our savings. We started up a social media page in Feb 2016 which contained loads of information for travelling families on where to go and what to see. Over time our Facebook and Instagram pages have become popular due to the content we provide. This has turned into partnerships and ambassador work for various companies which now funds our travels. You could say that we’ve started a little business on the road. We blog about our travels and work with Tourism organisations to showcase destinations through our photography and videography. We also write magazine articles and blog for various websites! It’s a fantastic lifestyle travelling Australia and we feel very privileged to be travelling and making an income on the road. All whilst spending time as a family and giving our children some wonderful memories. Travelling with three little kids can obviously have its moments. However, they are well adjusted to living on the road full time. They thrive on the ever changing destinations and constant adventure. From our time on the road we’ve seen many changes in our little ones and they've hit plenty of milestones. Travelling has boosted their confidence, learning and social interaction. There swimming is fantastic and they’ve developed resilient, outgoing personalities! I love that they're climbing trees, making sandcastles and playing with sticks and stones. It really is a fantastic lifestyle for them. As for our youngest she is now 3, having left when she was 6 months old, living in a caravan and travelling Oz is all she knows. She refuses to wear shoes, is forever filthy and purely loves being in the outdoors. Would we have it any other way?? Hell No!! Trying to prepare dinner with a baby on my hip! What child wouldn't love to be hanging out with mum, dad and their siblings. It’s a special time and goes by way to quick so I am very fortunate that we are able to relish in this time together. Living on the road is a lifestyle and we make sure to have our kids in a routine and have some sort of structure to the day. It’s important for them to acknowledge when the day starts and ends, when we have downtime and of course the dinner, bath bed time ritual. It reduces the tantrums and tiredness, making our day and our adventures go smoothly. We don't want a cranky three year old having a Tantrum halfway through a 6km hike (this has sooooo happened before though)! Being in a confined space can have the best of people getting cabin fever! So how do we handle this with kids on board? Well, it just never happens! I believe its a misconception out there when travelling. We follow the sun, so if we’re having a down day at the caravan we don't all sit inside the whole day. We’re out bike riding, grocery shopping, playing lego, busting some moves on the jumping pillow or swimming. The kids are forever occupied. Or they entertain themselves, a fantastic quality they've learnt while travelling. We often receive messages asking how we manage to entertain our kids and to be honest, we really don't have to. They make so many friends and their imaginative play is out of this world! They really are happy playing stick fighting games, throwing stones or building sandcastles. Routine - try and keep your kids on a routine as best you can, especially for the wee little ones. However, I think its important for all ages too, especially when doing school work etc. Involve your kids in the planning of your trip - They love talking about upcoming destinations and what activities we will be doing. It also great to prepare them for car travel the day before. It’s not a surprise then, that they will be sitting in the car for 500km+. Your house on wheels - I recommend getting a caravan to suit your family’s needs. For us it requires a shower and toilet. I really wasn't keen on the idea of getting three kids under 4 into the amenities to shower them every night. Toilet training is so much easier in your caravan! Pre cook meals - After a big day exploring, there's nothing worse then getting back to your van late and having to organise dinner for hungry kids. This is where I have ready made meals in the freezer. I cook the likes of tuna bake, zucchini slice and ravioli, pop it into a zip lock bag and freeze. I can pull it out, put it in the microwave or heat over the stove and the kids are fed in a couple of minutes! Spag Bol! Delicious and easy to freeze! Let kids be kids - Its not ideal but they do tend to have the odd tantrum. They can also be really loud and say inappropriate things. But, you'll find that most people are very understanding as they've had kids themselves or have grandchildren the same age. Most just laugh it off and so do we. You’ve got to have a giggle about it or else travelling with kids would stress you out! No matter how you travel or how much you spend, travelling Oz is a great way to get to know yourself and your family a whole lot better than before!! We love our lifestyle on the road and we are very happy to help out anyone with information along the way. If your keen to have a crack but need some info, just drop us a message in the comments or email us, we will do our best to help you out. GET A MONTHLY UPDATE OF OUR TRAVELS AND COOL GEAR! !